LinkedIn: More Than Just a Business Networking Platform | Reshift Media Inc. I attended the Social Media Marketing World convention back in March where I saw a number of great speakers. As I mentioned in my blog from March 12th, I was surprised of how many prominent speakers view LinkedIn as one of the most powerful yet under-utilized social media platforms. After hearing so many speakers sing the praises of LinkedIn, I thought I’d test this for myself. When posting, I typically get a few likes and the posts are viewed by a few hundred people, which I’ve always been pleased by. However, Guy’s comments left me wondering if I should I try experimenting different posts on LinkedIn, not just run of the mill business stuff. I decided to do a little investigating over the past few months. My first experiment was to try video. Linkedin introduced this feature last year but not a lot of people had been posting videos. 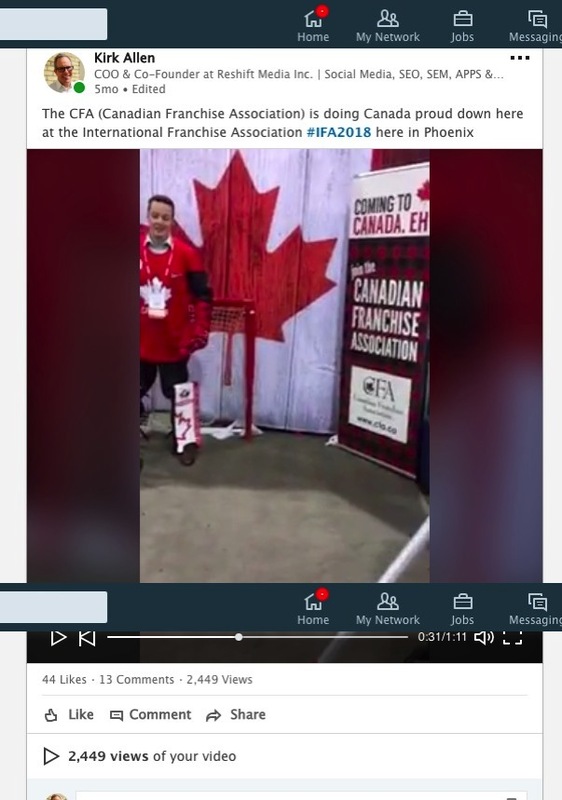 The video I posted was from the IFA (International Franchise Association) convention where the CFA (Canadian Franchise Association) had a booth promoting Canada as a great market to expand franchise locations. They had a hockey net set up and visitors had the opportunity to take shots on net to win a prize. It was a clever idea and generated lots of attention. Being a hockey player myself (beer league, let’s be clear), I decided to try my luck against Ryan Eickmeier from the CFA and Meredith Lowry, also from the CFA, was kind enough to take the video. The results from the video were outstanding. I’ve never seen that many Likes, engagement and views (2,500) from any post in the past. Test number #1 was a success. Lesson learned: video – let’s do more of that. My second test wasn’t anything new, but I wanted to try posting a simple photo and caption. My business partner Steve Buors and I were at the CFA convention in Ottawa. I took a picture of us after having just set up our booth before the conference. The results were off the charts. It received the most likes (137), comments and views (over 6,000) I’ve ever had by far. I’m sure tagging Steve had something to do with the great results. OK, so more pictures and more video, right? At this point, I really hadn’t ventured away from industry related stuff, so for my next test I wanted to try something a little different. 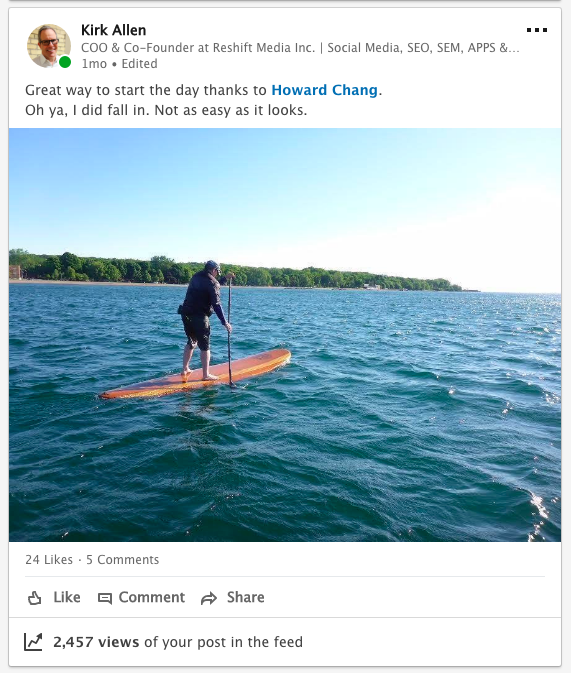 I went paddle boarding one morning thanks to a good friend of mine, Howard Chang. He snapped a picture after I fell into Lake Ontario. Typically I would have posted something like this only on Facebook and Instagram, but I decided to add it to LinkedIn, too. To my surprise, the engagement was pretty good. Way more likes, comments and views (2,400) than my more traditional industry-related posts. So I decided to post more personal photos. 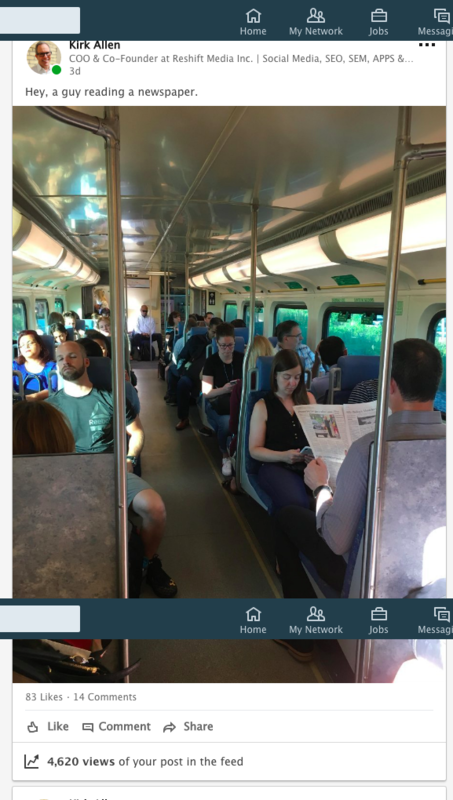 I was on the commuter train last week heading to the office and as usual, people were either sleeping or entertaining themselves on their devices. That day, something stood out to me – a gentleman reading a newspaper. I had to snap a pic because I used to be in the newspaper industry and thought some of my former colleagues would get a kick out of it. But the results blew me away. Once again, with simply a picture that I would have usually reserved for Instagram, the engagement was very surprising. Lots of likes, but more importantly, lots of comments and tons of views. I posted it first thing Friday morning and immediately got 1,500 views. However, by Sunday evening it was up to 4,100 views and counting. For a social media platform that is known for business networking, I couldn’t believe the reaction and how many people were active on LinkedIn on the weekend. Lesson learned! LinkedIn is more than just a business networking platform; it’s a social media platform where you can reach and interact with people well beyond your typical B2B conversation. And isn’t everything today about engagement? Experiment for yourself, and you may be surprised.